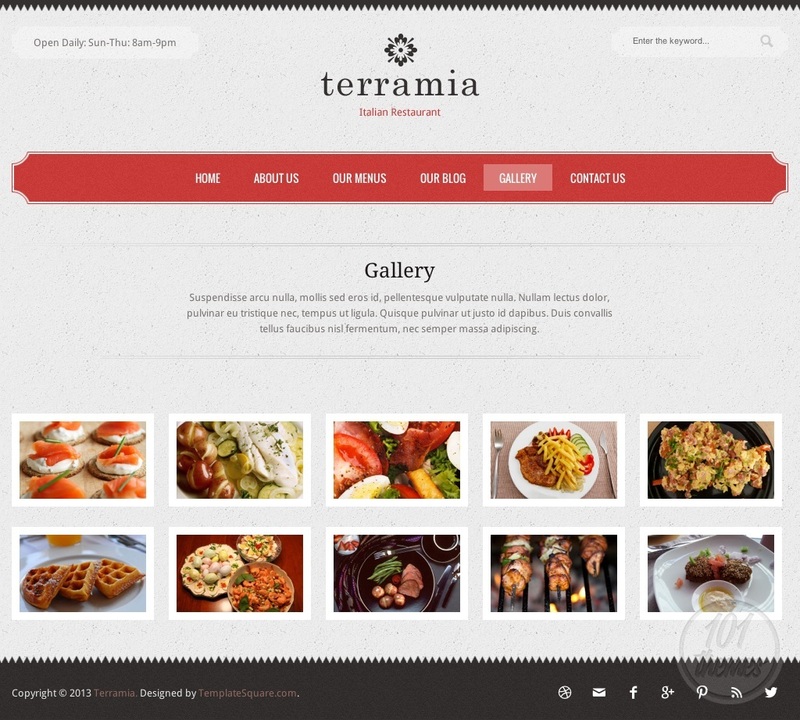 Terramia is a responsive restaurant theme for WordPress created by TemplateSquare and featured on ThemeForest. 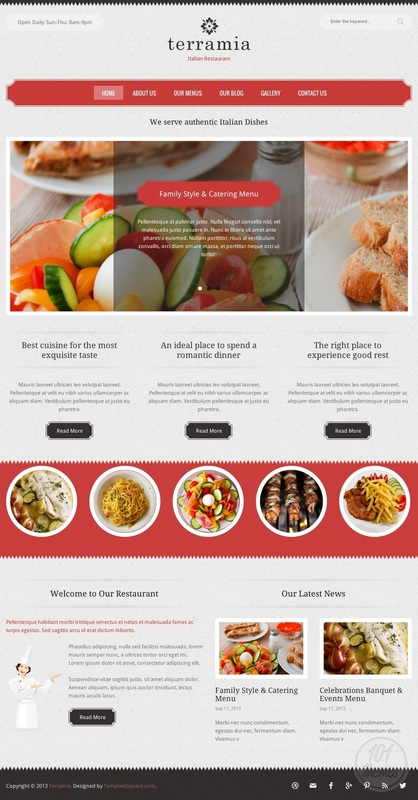 This theme can be used for all sorts of restaurants, regardless of the niche. 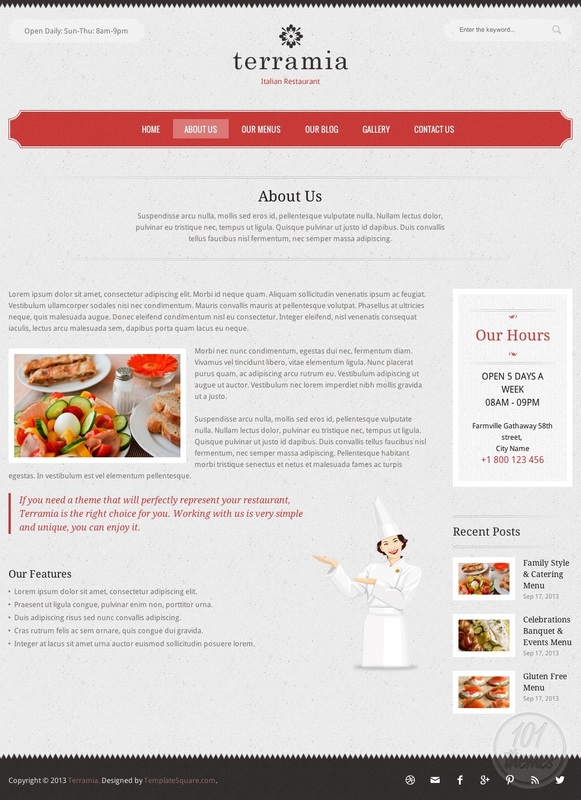 It is classy and elegant and your visitors are going to be delighted by the look and feel of your website. A nice mixture of colors was used for this theme: light gray, dark gray and red, with subtle patterns and nice fonts. The whole design places your content in the spotlight and highlights what’s important. A big slider is featured on the homepage, and you can place your most remarkable photos here for everyone to fest their eyes upon. You can feature various posts under this slider, and drag your visitor’s attention to them, making sure they don’t miss reading everything you find important to share. You can also feature various delicious dishes on your homepage and they will be displayed in automatically resized photos, which get shown in full size when clicked on. 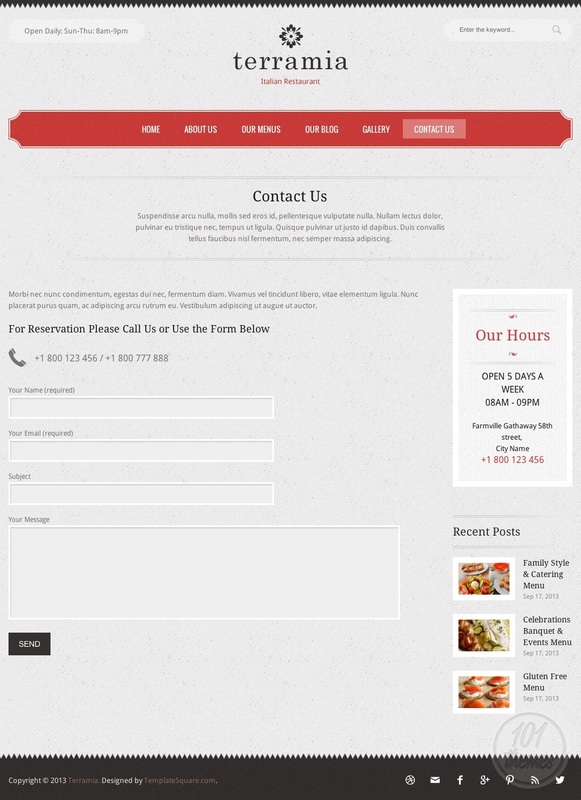 A nice welcoming post will warm the hearts of your readers, this is where you can tell them a bit more about your restaurant’s history, or introduce them to your staff, or even give them a nice suggestion on your favorite dishes, present your services to them, or anything else you’d like to share. You can feature this post on your homepage along with some teaser text, and after they click “read more” they will be taken to the full post page. 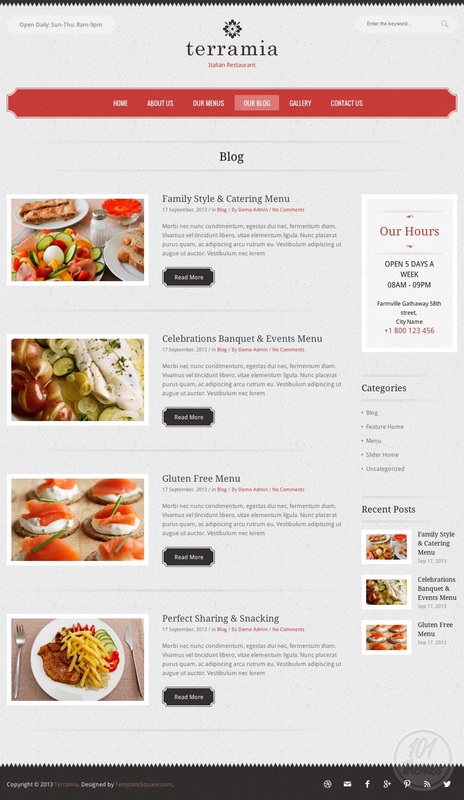 A beautiful menu is featured; it is easy to create it along with photos and detailed descriptions. 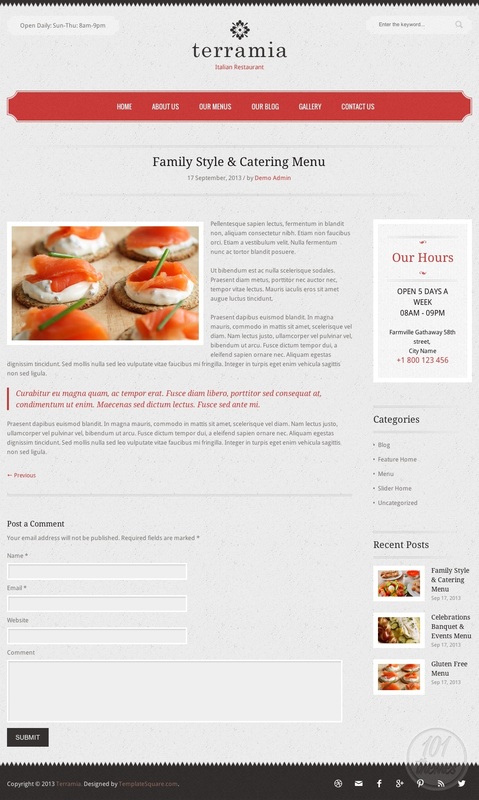 Your website’s content can be shared worldwide thanks to the great social integration this theme features. You will be able to connect to all of the most popular social networks. The opening hours will be shown on the contact page along with a simple contact form. 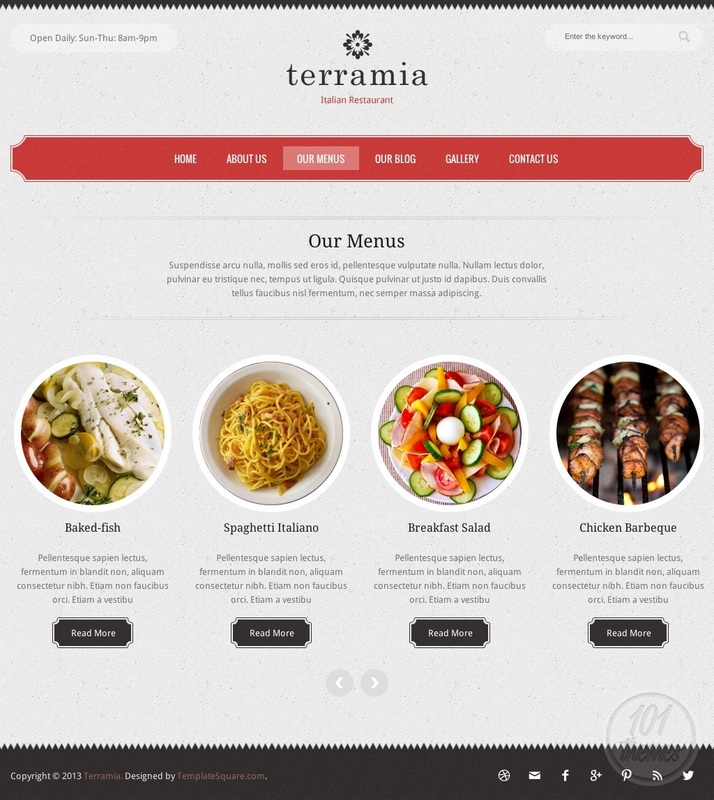 As a responsive WordPress restaurant theme, Terramia guarantees your website is going to look perfect on all devices, including various mobile phones and tablets.